After a happy period of a few years when the Virage performed perfectly, I suffered the dreaded one-way journey recently. This involved a trip of around 20 miles each way, to Bradford to get some bodywork paint samples made up. On the way out things didn’t look so good initially with some misfiring, and what sounded like a whole bank of cylinders going out. However, it picked up, and with a few misfires got to the destination. However on the way back the engine shut down completely, in one of the busiest streets just outside the town centre. Pushing a Virage by yourself to get it out of the traffic is no joke – and indeed not really possible. Even on big wheels it’s 2 tons of dead weight, and the slightest gradient or bump makes it impossible to move solo. Fortunately a few lads gave me a push, and we got it to the kerb side. RAC Relay got me home eventually after 4 1/2 hours, and we towed it back into it’s hanger. The problem was clearly related to the fuel pump, which was not operating. G*rry ran a direct connection to the pump and got the engine turning, but not starting. We initially thought the problem was water in the fuel tank again, but a good flush through showed none at all in the line, so we retired, puzzled. The other candidate was the old immobiliser, which had been bypassed, but not eliminated from the system when a newer alarm was fitted 10 years or so ago. Some weird electrical behavior over the years had led G*rry to think that it was intermittently causing problems, so that was a possible route to explore. In fact it turned out not to be the main problem, but in the process G*rry amazingly found the wiring diagram for the factory fitted immobiliser, a huge breakthrough, and one which enabled him to finally remove it from the circuit. Full details are provided here. 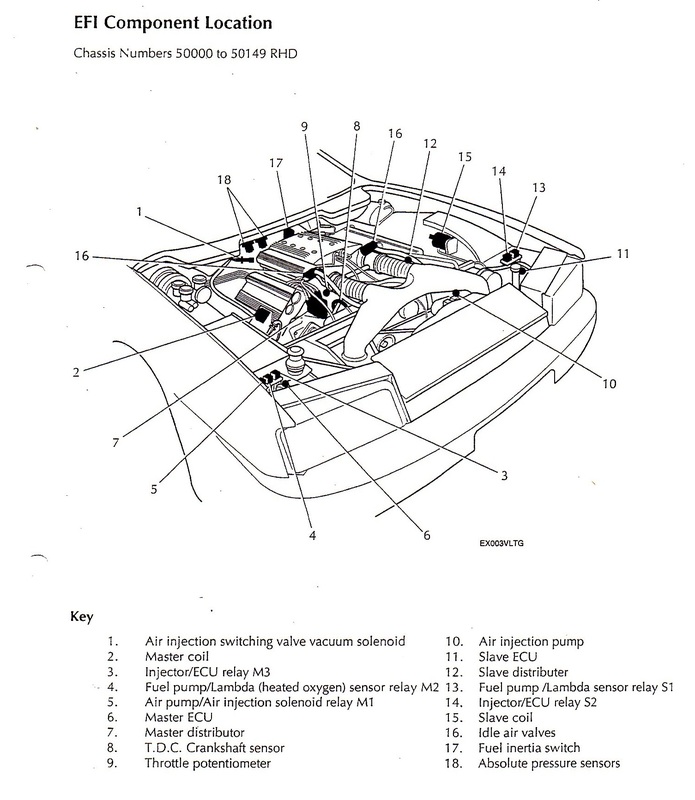 In the end G*rry traced the problem to the Fuel Injection Relays mounted on the bulkhead, and shown in the diagram below (items 345, 13 & 14). Although G*rry replaced them, later inspection showed all but one of the relays were working fine, and it was just the spade connectors that were corroded. 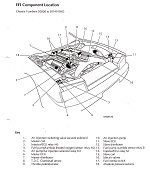 This shows up a central feature of the Virage – it implemented a sophisticated electronics system in the car, but just used cheap standard connectors to hook it all together. Normal corrosion will inevitably cause a problem – but for these ones in particular it is catastrophic as relays 4 and 13 control the lambda sensors and the fuel pump. So a key tip is – always ensure the relay connectors are in good shape and free from corrosion. Their unusually handy positioning makes this easy for once – and it’s worth doing annually and certainly before any long or critical trip, if you want to experience the rare and highly prized 2-way journey. The relays by the way are a pretty standard part – G*rry replaced ours with ones for his Jeep – so at least this is a fairly low-cost repair. If you right click on the picture below and select ‘download link’, you will get the full-sized version of the diagram.